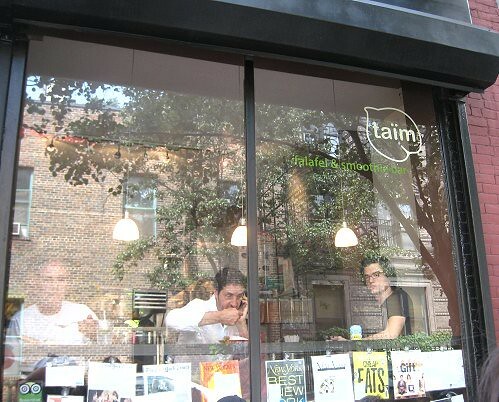 One of the places in New York that we were hoping to visit was Taïm Falafel and Smoothie Bar. One thing I can say about Bobby Flay though is it does seem he's pretty loyal. I mean, he's the only "celebrity chef" left at that network. Other celebrity chefs have long since left to be replaced by "personalities." Apparently, the owner was a former employee of Bobby's. On the show, I saw green falafels for the first time! I was so innocent then. JS and I ordered the Mixed Falafel Platter. 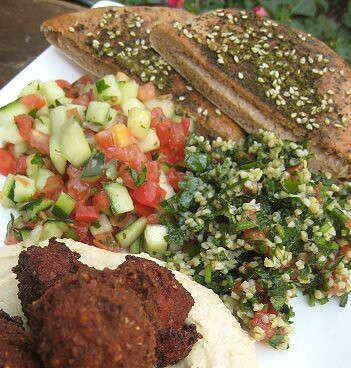 Taïm offers three types of falafels: Green (cilantro, parsley, mint), Red (roasted red pepper), and Harissa. 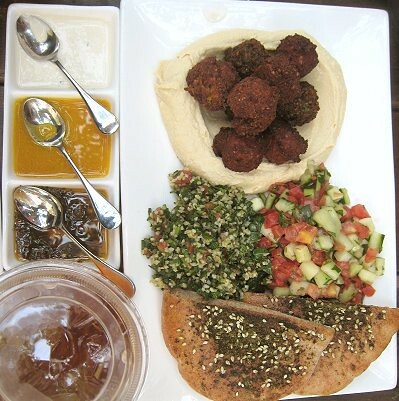 The platter also included hummus, tabouli, and Israeli salad. There's also za'atar whole wheat pita, and three different sauces. I ordered a drink too (lower left corner of the photo), but I can't remember what it was! Probably an iced tea? The Israeli salad consists of dressed tomatoes, cucumbers and parsley. It was a tad underseasoned, but OK. The tabouli is your usual: bulgur, parsley, tomatoes, lemon juice and olive oil. 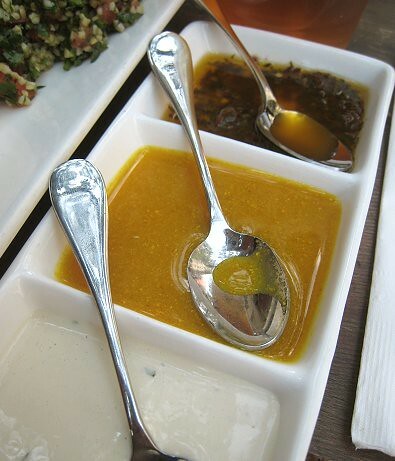 So, from bottom to top, we have tahini sauce, amba, and skhug. Amba is a pickled mango condiment. 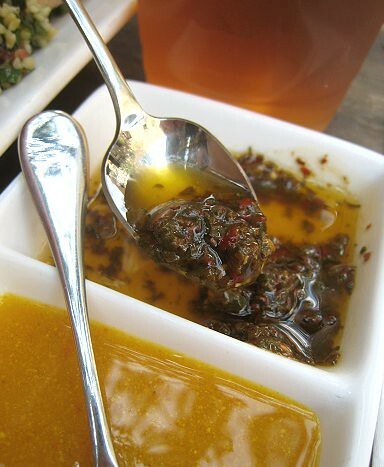 At Taïm, it was described as being flavored with fenugreek as well. It may be an acquired taste. Skhug is a hot sauce, in simple terms. 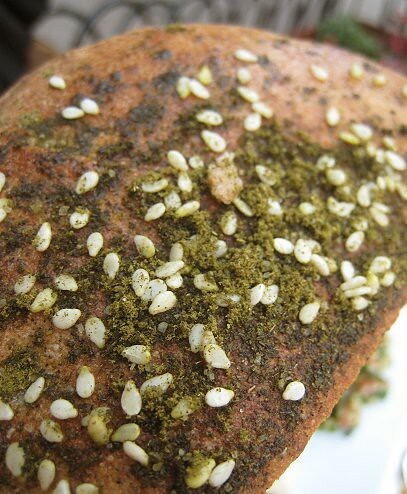 According the Falafelogs, it is usually made with crushed peppers, garlic, coriander, olive oil, and other ingredients. The Red (roasted pepper) and Harissa falafels were all right, but the real winner was Green! Look at it, all nested on almost-white hummus. Don't you just want to reach in and grab it? 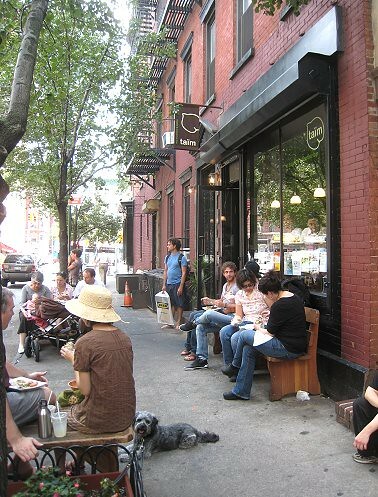 Taïm is a small place, so people basically sat on the sidewalk and ate their food. A falafel and hummus place... [dreamy faraway look]. As luck would have it, the Taïm website is under construction at the time of writing. Click here for their menu on the New York Magazine website. Interesting, I've never heard of falafels before, but I'd try them. And of course I'd try the smoothie bar too! Those looks delicious (I tend to be partial to the green as well. They're so pretty!). 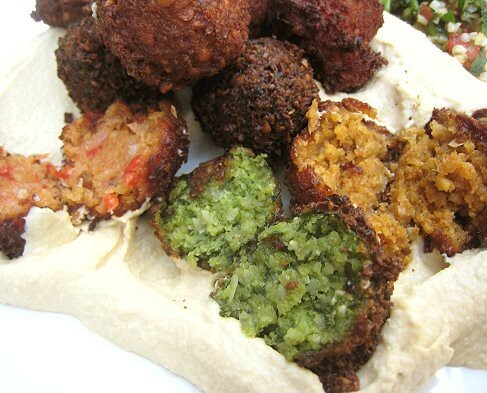 The best falafels I've ever encountered are from the "Falafel Drive Thru" in San Jose CA, if you're ever in the area. It's a local legend for good reason. I've been meaning to try Taim, but in NYC, I don't think I'll ever get to everything on my list. =( You got some great shots! I went there a looong time ago for a hummus pita. It wasn't as 'famous' it's now, so I was still able to grab a seat back then. Great food though! I like the variety of sauces. I've only had tahini drizzled on hummus. I also like green best. This place near me makes them with just the chickpeas and it just tastes so plain to me. Oh, I'm surprised! Do try falafel and their chickpea-y/garbanzo-y goodness! Maybe someday we'll be in the San Jose area... "local legend" eh? Haha, I know! One will never want for food there in NYC! We have yet to find a similar falafel place here in Vancouver. [sigh]. Man, you're really getting to me with these NY falafel and hummus shops!! Mike and I have decided that since we can't go on honeymoon right after we get married, we're going to go on a "mini-moon" to NYC....which means I'll be spending a lot of time on your archives in September!! Ha.. i love Taim falafels. I go there everytime i need my fix. I know! Those hummus/falafel places were great! Ooh, your mini-moon sounds exciting already!